How To Study Pathology for NEET PG 2018? There is no need for the candidates to go through each and every topic in all the subjects for the preparation of NEET PG 2018, if an aspirants gains command over few high yield topics or scoring subjects that have been tested by experts after going through each and every Medical examination paper you can achieve success in a smart way. Pathology is a very important subject of MBBS. 25% of weightage is given for pathology in PG entrance exams. A majority of the candidates find this subject tough and challenging. BEST advice to candidates is to concentrate then only you can get through successfully. When in doubt you must refer to latest edition of Robbins’ Pathology since it has been written keeping in mind South-East Asia. Cell Genome- In this, you need to prepare Epigenetics and how to diagnose a case of Epigenetics. Types of Collagen, where they are located and the diseases which occur due to their deficiency. This chapter is very important and must not be missed. Mendelian Inheritance – Autosomal Dominant & Autosomal Recessive. Be cautious of the fact that all dominant diseases do not present like autosomal recessive. Factors affecting autosomal dominant diseases such as Co-dominance, Pleiotropism, etc. Neoplasia – Try to remember only the most important mutations. If you prepare Immunity from Pathology, there is no need to prepare Immunity from Microbiology. Differential diagnosis of Pancytopenia – Pancytopenia with cellular bone marrow and Pancytopenia with A cellular Bone Marrow. You can also download the list of most important topics for PGMEE preparation. This topic can be covered with Medicine. 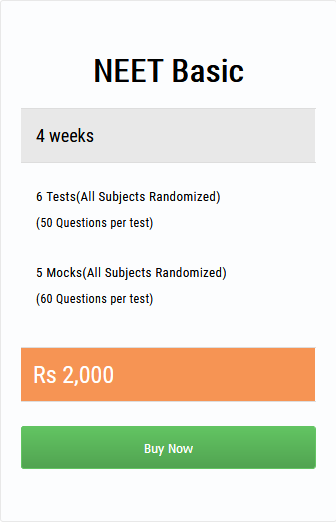 Candidates will get 300 multiple choice questions with single correct response. Questions would be asked in the exam in English language only. Please keep in mind weightage given to the MCQ’s will be completely provisional and the authority can make changes at any point of time. No marks would be deducted for wrong attempts. The test timing will be of 3hr. 30 min. Properly preparing the above mentioned topics will definitely help you overcome the barrier of Pathology and boost your score in NEET PG 2018. How To Study for NEET PG 2018, NEET PGHow To Study Pathology, How To Study Pathology 2018?, How To Study Pathology for NEET PG, How To Study Pathology for NEET PG 2018? How To Study Pharmacology for NEET PG 2018?